The entrance to the park, just off of Riata Vista Circle. 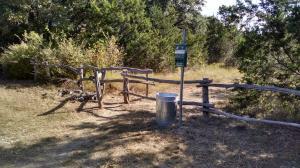 The San Antonio area is perhaps the most picturesque spot for hiking in the Lone Star State. With this new edition in the best-selling 60 Hikes Within 60 Miles series, all these visually stunning and ruggedly charming routes are at the traveler's fingertips. This handy guide helps San Antonio and Austin natives get back into nature without going out of town. Extensive at-a-glance information makes it easy to choose the perfect hike based on length, difficulty, scenery, or on a specific factor such as hikes good for families, runners, or birding. Each trail profile includes maps, directions, driving times, nearby attractions, and other pertinent details.